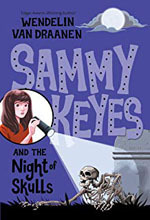 Starred Review "When Sammy and her friends cut through the graveyard on Halloween, they encounter a boy running away from a mustard-colored car. In the excitement, they wind up with the boy's bag, which has two skulls in it. As they begin to investigate, the friends come face to face with knife-wielding maniacs, corrupt morticians, grave robbers, missing people, and a caretaker who's vanished. What's going on in Santa Martina? Are the disappearances and the skulls linked? Narrator Tara Sands's distinct intonations are engaging. Her unique narrative style complements the author's humorous writing style. The interwoven plotlines are brought together expertly to create a fun page turner. VERDICT This is a terrific listen for avid and reluctant readers who enjoy humorous mystery and adventure."